Smith calls this extreme moral individualism. Ethical decisions were seen as relative to individual judgment, which others should not judge. This extended to such behaviors as cheating on tests or on a partner and drunk driving. For centuries, great religions and philosophers have provided guidance on moral choices, many of which are embedded in legal codes. Whether the ten commandants or the teachings of Plato, ethical bedrocks have been replaced in the minds of many young adults with nonjudgmental relative morality—relative to what feels right to each individual. To the degree this is accurate, the moral cohesive that binds our diverse culture together has been weakened. What does this say about where we are going as a society? Does it reflect how well we have instilled core values in our children, as parents and teachers? What does this portend for the future and decisions and judgments made by emerging leaders who hold such beliefs? If morality is relative to the individual, how can there be overriding ethical expectations for conducting our lives and our business? 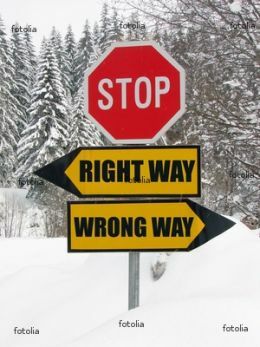 Is right and wrong truly dependent on individual judgment? I think not. Brooks calls the study results depressing. Yet crime and immoral behavior among this demographic is not much different than that of past generations in that age range. So something is sticking. Can moral judgment be distinguished from moral behavior? How much of what’s been revealed in Smith’s study is a reflection of insufficient thought or mushy thinking rather than deeply held beliefs? I don’t know the answer to that question. I do not think we are devolving into a “Lord of the Flies” society. But I do think now is a good time to ask ourselves, regardless of our age: What do we truly believe about right and wrong? What is moral and ethical? Is morality relative? If you believe so, then how much of it is? What is subject to individual judgment and what is not? Take the FREE Guiding Values Exercise. Copyright © 2011, F3 Forum LLC. All rights reserved. Construct is to manage your rationalizations and self deceptions to keep them from getting egregious. How about two further steps : do as little harm as possible, and do the most good as possible. we offer a Partnership Program for nonprofit organizations. Nonprofits can earn donations by referring people to our site. We then donate a percentage of their purchases to the organization. We also offer our book at wholesale for organizations that wish to sell it as a fundraiser. For more information, visit Find Fulfill Flourish. Steve Weitzenkorn, Ph.D., is an experienced business and nonprofit advisor, concentrating on the people side of organizational development, strategy formation, and change. He is a learning innovator and seasoned facilitator who has designed highly-recognized programs to improve leadership, trust, strategy implementation and communication, breakthrough interactions, service, and sales effectiveness. Steve donates about 25 percent of his time to helping nonprofits grow and innovate. To read more about Steve, go to About the Authors. Robin Damsky is the rabbi of West Suburban Temple Har Zion in River Forest, Illinois. Her work is devoted to building relationships and community both within and across faith and ethnic lines to bring greater joy and well-being into our world. A central way she achieves this is by helping individuals and groups find and strengthen their spiritual path in an effort to serve the greater good. To learn more about Robin, go to About the Authors.